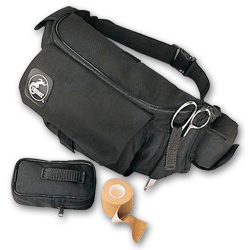 Easy to organize and access, this line of kits features Zipped Compartments with Movable Dividers, Elastic Loops, Nylon Pouches and Zippered Mesh Enclosures. Nylon construction stands up to rough handling. 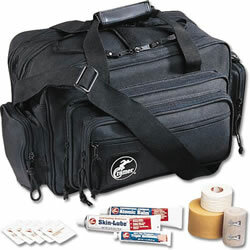 15-1/2" x 10" x 8"
Easy to carry, basic trainer kit items needed for a varsity sport. 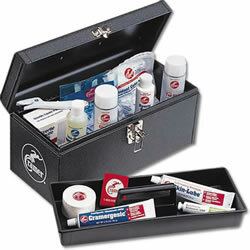 This kit is a fully stocked soft-padded sports medicine system, easy to use and re-supply. It has a cell phone compartment, and a shoulder strap detaches to become a cell phone belt. 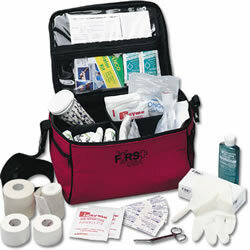 This gives you or your organization the peace of mind knowing participants at all levels have a Lifetime First Aid system just like professional athleties use. Contents: 6 After cuts and scrapes antiseptic pads with Lidocaine, 20 Antimicrobial skin wipes, 2 Rolls athletic tape 1.5" X 15yds, 1 Roll Pre-wrap 2.75" X30yd, 20 Bandages 1"X3", 6 Bandages 2"X4.5", 1 Blister kit with 2nd Skin and pressure pads, 1 Blood off cloth with blot cloth, 4 Instant cold packs 6"X8.75", 1 Cold pack holder (hook and loop), 1 Elastic wrap 3"X5yds, 1 Eye wash 4oz bottle, 10 Latex free gloves, 1 Reuseable ice bag with cap, 1 Lister bandage scissors 4.5", 3 Sport wound care kits with infectious waste bag. Cannot be shipped by Air.